May 5 at 2am, Myra Hoefer, a highly creative and superbly talented and influential California designer, and founder of Myra Hoefer Design, died surrounded by friends and white lilies and pale pink peonies, and her loving family. She was only 68, and had lived a vivid and inspiring life creating beauty and inspiring so many interior designers around the world. She was a longtime friend, and I will miss her greatly. I loved her designs, admired her ideas and wit, and I wrote about her often. Her various houses in Healdsburg and elsewhere are in several of my books (published by Chronicle Books and Taschen). Myra’s romantic and elegant mix of California casual décor with Parisian chic classicism set trends for the last twenty years—from Paris to Los Angeles, to her residence at the Ivy House in Healdsburg, Northern California. Her daughters Lisa North and Gina Gattuso will continue her tradition of style and inspiration at the office of Myra Hoefer Design in Healdsburg. Myra—you were so beloved and you will be so missed. 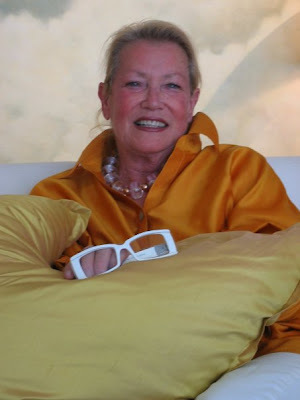 This very special post is in honor of California interior designer Myra Hoefer, who has left us with many happy memories of her dazzling presence and the beautiful rooms she designed, in California and in Paris. I’ve collected images of rooms she designed six years ago in Paris for you to enjoy and recall—and below is a re-post of an earlier story I wrote about Myra’s greatest hits, and a lovely collection of carved decorative furniture she launched four years ago. The golden years of Myra’s thirty-year career was when she was engaged to design a series of chic apartments for Chez Vous, a California-based company that offers Paris rentals, most of them on the prettiest streets of the Left Bank, the Marais, and on the Ile Saint-Louis. They are included in an iconic small volume, PARIS STYLE, with brilliant photography by Deidi von Schaewen and published by Taschen. Myra completed a series of private apartments—on rue Jacob and rue Bonaparte and many other resonant streets. We were delighted to work with Paris-based Deidi von Schaewen (who also shot ‘Indian Interiors’ and ‘African Interiors’ and many other style books for Taschen). We produced these images of Chez Vous apartments in Paris one glorious summer about 5 years ago. We dashed about the Left Bank on a lovely quiet summer weekend to complete and style the apartments and fill them with flowers. Myra was driving her cream-colored Beetle. She would park momentarily on the sidewalk (forbidden but necessary), and I would dash into a flower shop and emerge with Casablanca lilies, cream and palest pink garden roses, or armfuls of wild fennel branches. We would speed along rue du Tournon and hurtle along rue de Seine and boulevard Saint-Germain, and she would screech to a halt, and I would pounce into a grocery to pick up paper bags of white peaches and figs galore. On another stop, a favorite florist on rue du Bac, I’d scoop up palest pink peonies in full bloom, along with fern fronds and white garden roses, each specifically selected for a precise placement in a bedroom or on a dining table, or beside a sofa or perched on a marble mantel. We'd speed back to the apartments. With fragrant bouquets and tender peaches, we climbed many creaking stairs and threw open the windows. Styling was fast, Deidi was ready to shoot. The great and beautiful photography is by Deidi von Schaewen. She loved the exquisite poetry of Myra’s work, and the seeming effortlessness of the natural linen-covered sofas, Astier de Villatte dining tables, jute-lined linen curtains and white porcelain. In a spontaneous gesture of love and great appreciation for Myra, I found the pages in PARIS STYLE and clicked these images for you. These apartments, offered for rent by the California-based Paris apartment rental company, Chez Vous (www.chezvous.com), were some of the most poetic and beautifully romantic interiors by Myra Hoefer. One sunny apartment overlooked a courtyard on rue Jacob. Another was in the Marais, near the Picasso Museum. I've written about them many times. Also in fond memory I'm re-posting an earlier story about Myra and her collection of hand-carved decorative accessories. Beautiful. In Los Angeles this week I attended the highly successful and inspiring Legends 2015, the superbly co-ordinated design event produced by La Cienega Design Quarter. Among the 6,000 designers and editors, architects and design enthusiasts who attended were many editors and designers who had known and worked with Myra. They were very shocked and saddened by the news. I’ve gathered their tributes here, in honor of Myra. As I was departing from Los Angeles, I chanced to meet Coleen Rider of Coleen & Company. Coleen designs and crafts wonderful lighting designs for indoors and outdoors. It’s sold in showrooms around the country. We talked about the success of the La Cienega Quarter event. I told her that I was very saddened by the tragic loss of Myra. Exclusive preview: The brilliant California designer Myra Hoefer is launching a captivating new collection of French-influenced decorative furniture, lighting and accessories. Called A La Reine, it is Fantastique! Bravo, Myra Hoefer, for your chic and witty new furniture and lighting collection. I want them all. Interior designer Myra Hoefer has a talent for making her fantasies come true. First she spent years designing astonishingly chic apartments for the Chez Vous apartment company in Paris. Now she is launching her A La Reine furniture and lighting collection, all handcrafted in Vietnam by top craftsmen under the direction of a French design colleague of Myra’s. But first, let’s see how this dream of re-creating French-style furniture evolved. The story starts in Paris. “I always dreamed of living and working in Paris, and a dozen years ago I worked first on the design of a friend’s apartment on avenue Beaumarchais, and then apartments all over Paris for Chez Vous,” said Hoefer. Many of these glorious apartments were photographed by Deidi von Schaewen and published in the super-best-seller ‘Paris Style’, an Icon book by Taschen. I worked closely with Myra and Deidi on the Paris photography projects for this must-have style book. An apartment designed by Myra is on the cover of the book (shown here). 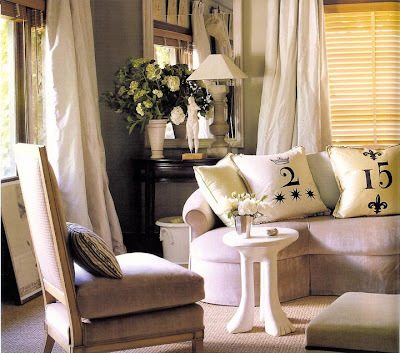 The white-painted chairs and chic furniture captured in that cover shot are directly related to the A La Reine collection. From her antiques-filled studio and small apartment on quiet rue des Tournelles in the Marais, Myra acquired antiques for her clients, and researched and sourced fabrics, furniture and accessories and worked with skilled craftsmen to make furniture and lighting. The idea of launching her furniture collection began. Her first pieces include a super-charming ‘goat leg’ bench, a ‘knot’ tabouret, and a handsome shell chandelier. Each is hand-carved and hand-lacquered. Iron frame, white finish, hand strung shells. All hand-assembled and crafted. Center electrical with candles. Hand carved acacia wood rope with Charolais white hair hide. This selection from the collection A la Reine by Myra is available through Myra Hoefer Design. On display at the showroom, Myra Hoefer Design, 309 Healdsburg Avenue in Healdsburg, California, or call MHD's office (707) 433-7837. Website www.myrahoeferdesign.com. She kept an apartment in a handsome 18th-century building which surrounds a cobblestone courtyard and grand porte-cochere. She studied French style, French life, la vie Parisienne. 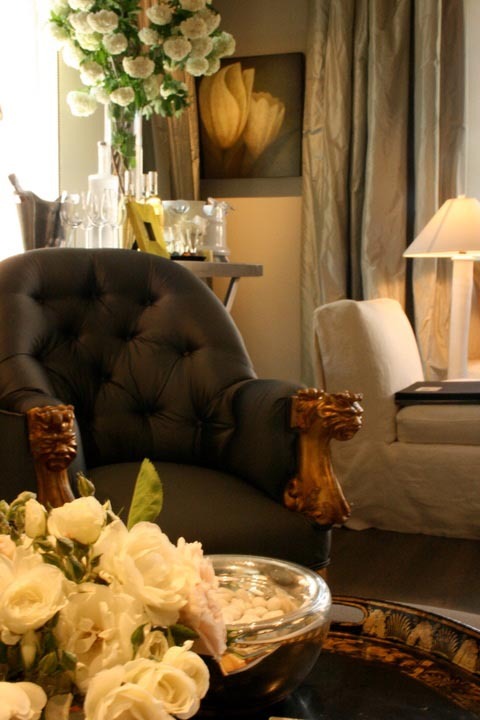 She became a connoisseur of the finer aspects of French design, and French design history. It’s an art to juggle Paris style and California sensibilities, and Hoefer found a balance and her focus. She infuses California rooms with exquisite French detail—but at home the rooms are not so precious that her grandchildren or her lively Jack Russell terriers are afraid to enter. Several of her interiors are in my books. Her Healdburg house is in ‘California Country Style’ published by Chronicle Books. Gilt-edged, in the living room of her Healdsburg house, decorator Myra Hoefer displays her love of contrast—and a splash of gold. On an Italian console table she arrayed a French handcrafted lamp with a parchment shade. The mirror and carnival mask are Venetian. The ceramic stove is Dutch. 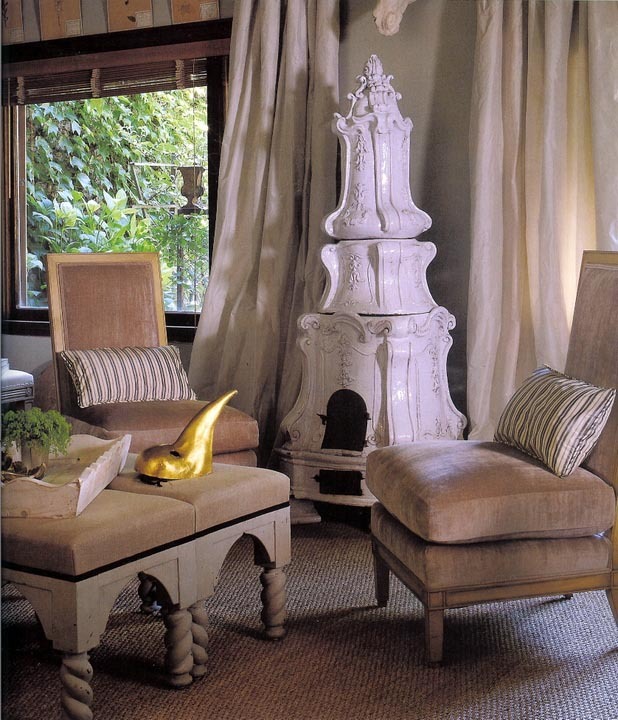 A pair of Paris salon-style chairs is covered in pale taupe linen velvet. Hoefer also has a chic style shop on the plaza in Healdsburg that sells highly original collections of French antiques, contemporary sculptures, glamorous tableware, iron daybeds and a revolving door of Provencal props and rare Parisian décor. A vignette from Myra Hoefer Design shows the white-painted furniture she loves—and the French influence that inspired her new furniture collection, A La Reine. Her new A La Reine collection was directly inspired by her French life. Paris apartments by Myra Hoefer were given a ‘California fresh air’ treatment, with natural linen slipcovers, pale but cheerful colors, and lots of sunshine and open windows. Myra’s work in Paris, decorating eighteenth-century apartments, inspired her chic and lovely new furniture and lighting collection. Hoefer’s Healdsburg, California, house is her homage to Paris. Pristine white linens and pewter candlesticks with lavish silk taffeta draperies, simple seagrass matting, and dog-friendly silken slipper chairs. Perfectly at home with her provincial French work table and American pine cabinet are a Portuguese-style table, an Italian rococo console flecked with gold, and lavish landscapes. The new A La Reine pieces fit right in. "My furniture designs and my interiors are energized by both Paris and California," said Hoofer, whose daughters Gina Gattuso and Lisa North work for her design company, Myra Hoefer Design. "Visits to Paris always inspired my design eye. Paris and the South of France are a constant education. The classic architecture, the tonalities and textures of limestone, the playful and elegant decor, the richness of French design history, all enrich my design education. 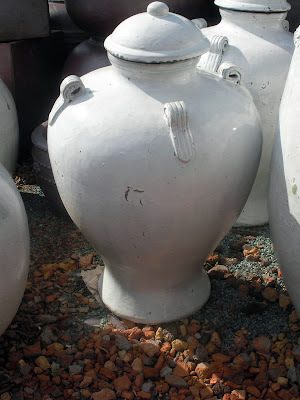 I find vintage fabrics for pillows, or discover new chandelier designs or a lamp-maker. I love it. 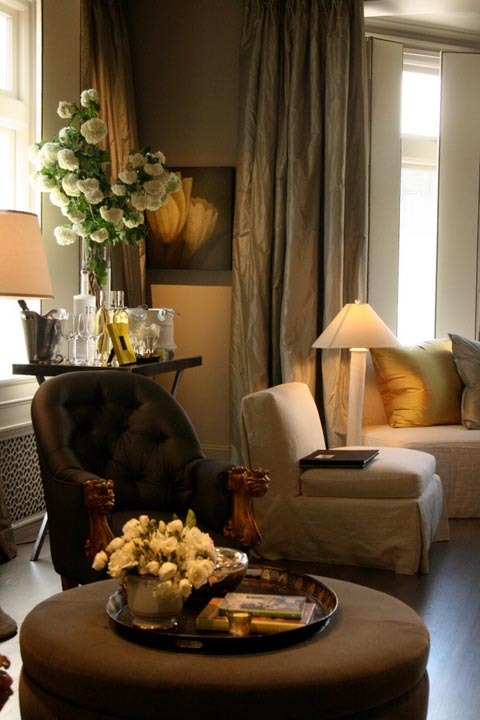 Now I am pouring those ideas into my new furniture, lighting and collection." More furniture and accessories designs for A La Reine are in the works. It’s a bold and imaginative move—and I can’t wait to see the new carved wood ‘topiaries’, and elegant glazed ceramics, the eggshells boxes and carved and painted furniture yet to come. Bravo, Myra. I wish you great good fortune with A La Reine. 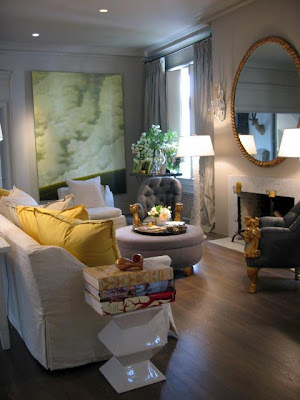 A room designed by Myra Hoefer for the San Francisco Decorator Showcase 2009 demonstrated the color tonalities she loved: taupe, grey, and greige, with splashes of white plaster and paint. All product photography by Myra Hoefer and Myra Hoefer Design, used with permission. A selection of Myra Hoefer-designed rooms include the pale lichen-walled and silk-curtained Ivy House, Myra Hoefer’s residence in Healdsburg, photographed by David Livingston, San Francisco. San Francisco Decorator Showcase 2009 room and vignette with white table photographed by Myra Hoefer Design, used with permission. I very touched by the following message I received from Myra's grandchild. I've posted this week's story to Facebook--and have received many many messages. Some were from friends who knew Myra, and others are from friends who knew her work and admired it. I am so happy to hear from the very articulate Wyatt. Wyatt North here. I am Myra Hoefer's oldest grandson. I just wanted to say, I highly respected your piece on my nana and found that it was the most REAL and genuine thing that I have read so far. I loved the way you framed it, and it means a lot to my family to have a wonderful writer like yourself write such beautiful words regarding my nanas life in a pure and truthful form. A fine, discerning designer and woman gone too soon. Thanks you for such a lovely and poignant tribute Diane. I am the exact age (68) that Myra was! I had followed her all of my decorating life....and I have so much respect and admiration for her work. Her houses in Healdsburg; her flying to Paris and "doing up" those chic apartments ; she really could "do it all"! I will miss her. She was a true original! What a lovely tribute you have written! Brava! Thank you for your beautiful post on the talented Myra Hoefer. I have long admired her work and appreciate your sensitive words. I, like so many others, have collected images of Myra's work for years as a reference on how to create that perfect chic yet livable space. I have been a collector of your design books as well and was pleased to see you attend LCDQ 2015 as an ambassador. What a lovely tribute. Thank you. We lost not only a most talented designer, but also an amazing spirit. 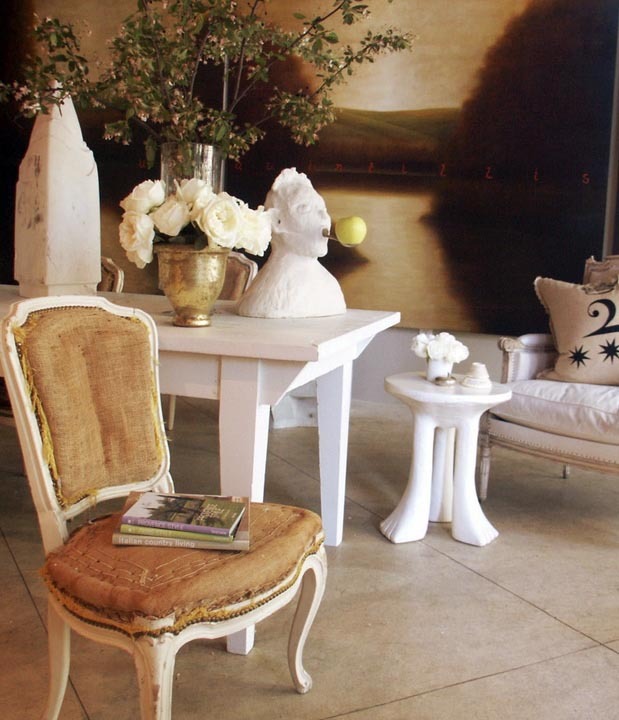 Myra brought a romantic French mood to California and created a style that inspired many, clients and colleagues alike. But her energy when she was in the room and her infectious smile are what I remember the most. Thank you for this beautiful encomium Diane. So sorry for the loss of your dear friend Myra. I shot with her once in her shop in Healdsburg and found her to be a warm and welcoming person. She was a great talent that will surely be missed. Beautiful, touching tribute, Diane. So sad we lost Myra. Too young....she was a unique soul. Count our blessings. Thanks for the tribute Diane. Myra will be missed by so many people, myself included. She was a real dame; ferociously funny, smart and sweet. And god knows she had her opinions but she never let them have a cutting edge. Everything she said and did was colored with love. I'll never forget going to Versailles with her. I will never look at the chateau the same way again. Just read you blog.....your words about Myra were truly beautiful & inspiring! So sorry to hear the news about her. Many readers of THE STYLE SALONISTE and many of my friends…and friends of Myra…have sent lovely comments. So very sorry to read of Myra's passing. She was a spreader of beauty and joy. Just want you to know that my heart is with you. Thank you Diane for such a beautiful tribute to Myra. She was one of my dearest friends, an absolute inspiration, my partner in crime and the reason that I built my weekend place up in Healdsburg. I've lost a friend, but the design world has lost a Legend. Her singular pursuit of beauty in the face of insurmountable physical challenges is truly an inspiration. We miss you Myra, but the power of your work is all around us. Myra would have loved your piece, Diane. A fitting tribute to one of the chicest women who ever walked the planet. She just had the best taste! She was so courageous and such a powerhouse. I will never forget her. Thank you for this beautiful post, which I read with sad surprise. I first met Myra and her husband Wade in 1975 through our mutual mentor and her constant companion, Ed Francavillese, who was a student and acolyte of Van Day Truex. She had such great style and was always such a good time. She was always eager to learn and to explore...she couldn't get enough of it. She had developed such a beautiful and distinct aesthetic of her own over the years and I always loved to see her work as she honed her "look" and knowing her design lineage made it all the more interesting to watch. Rest in Peace Myra.